xD He's taking a self-e.
You made it look totally professional, everything is just flawless amazingwork! ohmygoodness this just made my day! I'm really digging the perspective here. A cool angle that isn't used too much but really should, so great job! I also really like the background and the coloring is very nice. That's so cool.... The lineart is just right that is shows off the simple colouring and shading very well. AMAZING! Can I use it for a card? Woow *__* Will you do Daikenki ? this has got to absolutely be one of the best drawings of aaken or any other pokemon for that matter that I have ever seen.. amazing man amazing! I'll keep one and name it Archie! My favorite fossils ever, as awesome as Aerodactyl if not awesomer. It'll be on my team, unevolved, and nicknamed 'Rocko'. thats one of my fave fossils!!! will you take more requests? YES!!!! i love this new guy!! your coloring style is so real and great. in the thumbnail I thought i was looking at a picture almost. haha, im careful not to make it too 3-dimensional. Nice simple shading, and I like the little details on the feathers. It's detail but it doesn't distract, good job! 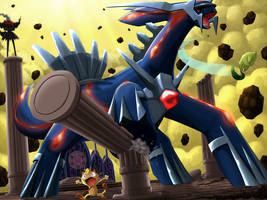 yeah terrible ability.. but I like how this Pokemon looks. Nice! You should do Aakeosu! Woah this ROCKS, i love the colours/shading effect you put here! I love this little feller. Nice job!